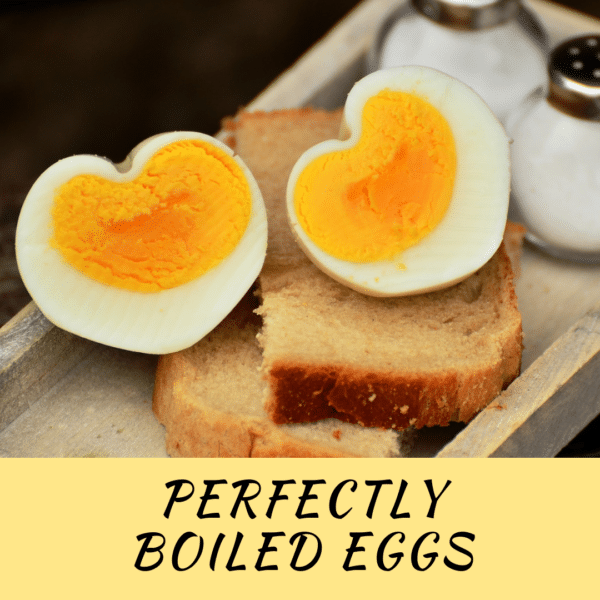 This easy recipe for perfectly boiled eggs is done in 10 minutes, and you’ll never worry about overcooking your eggs again! Eggs have some of the highest biological value for protein. One egg has only 75 calories and 7 grams of complete protein (4 grams from the white of the egg and 3 from the yolk). Each egg has 5 grams of fat and 1.6 grams of saturated fat. Eggs are also one of the only foods with all of the fat soluble vitamins – A, D, E, and K.
Eggs are a staple in most houses, and they are the perfect addition to any breakfast or to eat as a snack! An easy way to prepare eggs are to boil them! Getting perfectly boiled eggs is something that is so easy to do but it seems so hard to get right. The eggs cook too long and then you wind up with this green ring around the yolk, which makes it look disgusting. This recipe for perfectly boiled eggs is done in 10 minutes from the moment your water starts boiling with the eggs in it. My friends and I love to tell the story of how we learned how to make perfectly boiled eggs. One of our professors had us do a 2 hour lab day making eggs different ways from scrambled to boiled to over-easy. Each station had to prepare boiled eggs different ways to see which one was the easiest to peel, the best looking, and easiest way to cook. As it turned out, starting with cold water, simmering for 10 minutes, and then immediately cooling them down with really cold water was the best way to get perfectly boiled eggs. Once the 10 minutes is up, immediately pour the water out. This easy recipe for perfectly boiled eggs is done in 10 minutes and you'll never worry about overcooking your eggs again! Place 6 eggs in a medium sized pot. Add water to just above the eggs. Heat the water on high until boiling. Once the water starts to boil, lower to medium-high heat and set a timer for 10 minutes. At 10 minutes, dump all the water out and run cold water over the eggs for 2-3 minutes.